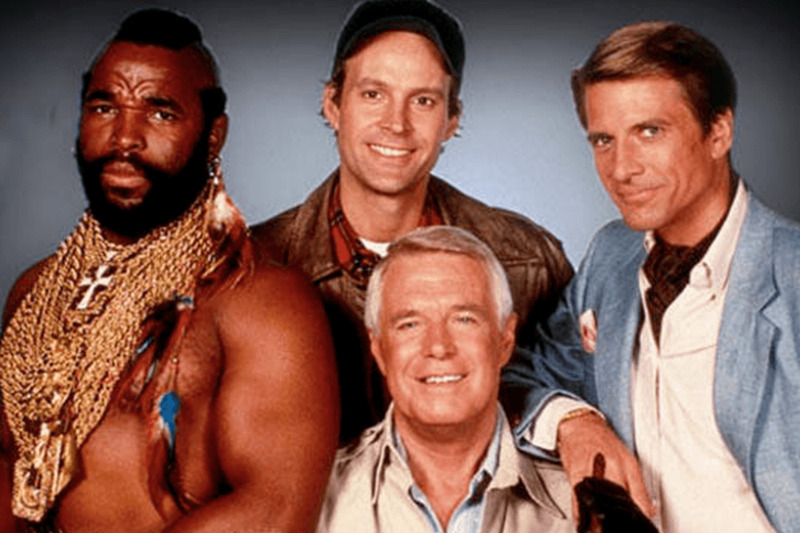 Back in the 80s the A Team was one of the biggest shows in the world. The show was the story of four Vietnam veterans who helped people in need while themselves being pursued by the authorities for a crime they wasn't guilty for. The A Team played out like a modern day western with equal amounts of drama, action and comedy. For me even today this show is one of my all time favourites and here is just five reasons why. "First name middle, second name period last name T".Mr.T played the character B. A Baracus (the BA stood for Bad Attitude). Although BA was a big, often bad tempered Mohawked veteran he had lots of time for children and was often down at the youth centre helping out or teaching kids wrong from right. As a child I remember thinking that if MR T/BA drank milk then it was fine by me. It was almost guaranteed every episode that BA would have a clash with the biggest henchman and this would usually end with him throwing him some distance. Whilst the nature of the A Team meant that there was plenty of shoot outs, fights and car chases the reality of the show was that (with one exception) no one ever died on screen. Usually the shootouts would end up with the A Team out gunning their opposition then rounding them up to be dealt with by the authorities. Another classic A Team continuity was that everyone who crashed their vehicle got out safe and the producers used to make sure footage of the crash victims escaping their crushed up vehicles was shown. Whilst America is perhaps famed for having one of the finest militaries in the world it seems at least in the A Team universe to also have the dumbest Military Police forces. Colonel Lynch who was originally in charge of the capture of the A Team would frequently roll into town just in time to see the smoke of the GM vans tyres or the shape of Hannibal hanging from a helicopter rope ladder, cigar in hand. When Colonel Decker replaced Lynch the captures got closer but even when they managed to grab nearly all the team, the last guy would always bust the rest of his comrades out. Surely the best car for avoiding capture from the authorities would be a nice and fast sports car? Or perhaps a inconspicuous little family get around?. Apparently in the 80s it was a massive muscle van with a distinct red stripe around it. Whilst only being a van it regularly managed to outrun any other vehicle and had a knack for staying together even after the most ridiculous of in air jumps. I guess it would have been hard to keep all the necessary equipment needed to be the countries best good guy, problem solving vigilantes in the back of a Nissan. I loved it when a plan came together. Hannibal ( named after the famous military strategist of the 6th century) was a man with a plan....and usually the plan was pretty special. Even when captured or knocked out it later became apparent that this was all part of his plan. There was countless amazing plans but to summarise it usually meant meeting the bad guys, having a punch out,messing with their business affairs and leading to a final showdown in with a outnumbered A Team used gadgets, ingenuity, bravery and luck to get one over on the bad dudes....add in the Faceman getting lucky with the prettiest girl in town, Murdoch taking on a crazy persona and Mr T throwing there largest guy through a window when their weapons miraculously ran out of ammo at the same time and you have yourselves a hit show.